Miguel brings with him more than 20 years of experience in hotel investment, asset management, operations, finance, feasibility, and valuation. Prior to founding Willow Street Capital, he was Head of Hotel Investments at FCA, a private investment fund part of Libra Capital. At FCA, where he oversaw the turnaround of a portfolio of 11 upper upscale and luxury hotels. Under his leadership, the portfolio was on track to increase trailing-12-month NOI by more than 90%. Prior to FCA, Miguel was a partner in the Hotel Asset Management division of HVS, the world’s leading hotel consulting firm. There, he oversaw a portfolio of properties with more than 3,800 guest rooms and worth over $1 billion on behalf of a diverse group of owners. He consistently generated significant NOI increases at properties he asset managed. He negotiated favorable management agreements for clients, and helped clients to buy and sell hotels and implement management transition plans. Miguel was an SVP at Jones Lang LaSalle, where he worked on more than $880 million worth of hotel transactions while leading the group’s Latin American operations. Before that, he was an Associate Director at Standard & Poor’s, where he served as a lead analyst for new CMBS transactions. He oversaw the underwriting and credit analysis of pools of mortgages of commercial properties of every type. Previously, he was a Vice President at HVS, where he valued more than $2 billion worth of hospitality real estate throughout the United States, Canada, Mexico, and the Caribbean. 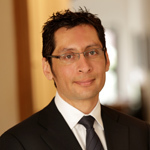 He formed part of the Vancouver and San Francisco HVS offices, and initiated the firm’s Mexico business in 1999. Miguel holds an MBA from Yale University and a BS in Hotel Administration from Cornell University.